Medical innovations and developments are deeply anchored on positive, accurate, and reliable clinical research. Patients are usually placed at the center of the research with their profiles and medical history analyzed, curated and aggregated in order to understand infections, test hypothesis and make discoveries. The importance of clinical trials can never be overstated. Currently, the global market value for clinical research is pegged at around $3.6 billion. With a compound annual growth rate (CAGR) of 5.5% the value is bound to exceed $65 billion by 2025. There are several health institutions and pharmaceutical companies that are engaged in concerted efforts to raise the bar in clinical trials and research. Despite the encouraging statistics, clinical trials and research are faced with massive challenges and obstacles. Challenges of reproducibility, privacy concern, data sharing, and patient enrolment are still rife in contemporary research practices. Additionally, the formulation of several legislations and guidelines on the protection of health data has increased the need for enhanced data integrity, privacy, and democratization. The goal of a majority of healthcare actors has always been to provide improved care to patients. However, most often the attempts to improve health care services have been left to services providers almost completely ignoring the patients’ input. With the current digital dispensation and institutions of regulations such as GDPR, HIPAA, and ACA, patients are being brought to the fore. However, there are various factors impending to curtail the ability researchers and patients to share information for clinical trials. Since 2010, the number of annual, active and registered clinical studies in the United States has doubled from around 40,000 to the current 93,000. Almost every clinical trial requires patient participation and data for increased accuracy and reliability. Despite, actively recruiting participants most studies attract patients who are suffering from the targeted diseases. Without a single point of reference the patients normally portray inconsistent results since each of them seeks advice from their preferred physicians. The process of collating and aggregating medical information from diverse health centers and physicians is always a daunting one for patients. Patients are required to fill in numerous forms for analysis. With such a demanding and time-consuming approach, many patients are discouraged from participating in studies. A majority of people are not motivated to share their data or participate in studies unless they are suffering from a disease. Lack of incentives slows down the evidence generation process leading to the entry of redundant data. Medical records are one of the most intimate and valuable pieces of information about a person today. Access to ones medical records allows you to not only to know their identities but also genealogy and lifestyle activities. In fact, medical records are worth more than credit card information in the black market today. In the recent past, there have been several high profile attacks targeted at patient’s medical records. Due to the sensitivity surrounding medical records patients are more reluctant to donate their information. With numerous organization deploying EHR and EMR to enhance patient care a lot of patient information is now scattered across, physician, medical centers and health plans. Most of this data is stored in diverse digital formats making thus making it difficult to aggregate and analyze the information consistently. For starters a majority of clinical trials are unable to meet critical threshold timeliness, due to the uneven distribution of information and patients. Further there are significant challenges in racing the required patient consent. There have been numerous instance whereby clinical trials have been accused of failing to provide the valid consent documents from patients. It is also significantly challenging for researches to regain consent after protocol modifications have been executed. Since time immemorial the challenge of building and maintaining trust among researches, sponsors, regulators and data subjects has been a major pain point for research activities. After hearing or experiencing horrors stories concerning intellectual property and data misuse research stakeholders have developed strained relationships and mistrust towards each other. Another, pain point that has plagued clinical trials is the inability to allow real-time detection and response to errors. Researchers are far much concerned with their process and operations than verifying data from data subjects. The requirement for real-world-evidence in clinical trials has led to an increase in complexity for the already tedious and complicated process of tracking and monitoring patient condition. Another pain point for clinical trials is data integrity. Considering that clinical trials revolve around sensitive and confidential information, it is important that data is protected in a way the patients feels is secure and trustworthy. Some of the most significant signature features of the blockchain network are inviolability and historicity. Once a transaction has been conducted on the blockchain network it is validated and recorded to prevent against posteriori reconstruction. With cryptographic validation, it is virtually impossible to enter falsified transactions into the system. Each of the validated transactions is timestamped and transparently stored in the system. Timestamped and tracked transactions mean the overall integrity of the system is improved. Researches and patients are therefore willing to share data information without fear of reprisal, theft or misuse since ownership and existence of data are now provable. Blockchain provides a trustless community for sharing data. Instead of trusting the transacting parties users place there trust on blockchain peer to peer protocol. With an infrastructure designed primarily for privacy, blockchain is surely a viable option for community-driven sharing. In fact, numerous studies have indicated that over 80% of patients are ready and willing to share their medical information, on conditions that their privacy and security is maintained. Furthermore, Blockchain allows for enhanced transparency since there is no single entity that can claim ownership of a database. Everyone can write their transactions on blockchain ledger and access information without the need of a third party.these mechanism enable researchers to crowd recruit participants. The implications for these provisions in clinical trials is that researchers are able to access a wider pool of research participant and data. An increased sample size from diverse location will help in enhancing the statistical probability of the data being examined. More so, data sharing amongst researchers will enhance reproducibility and open up studies to secondary(meta) analysis. Aside from achieving trial-phase computability, blockchain can also be used to set up dependability and relationship between studies and procedures. Using blockchain smart contracts it is possible to increase traceability and control over the sequence of clinical trials. By definition, smart contracts are computer protocols that can be used to enforce or validate contract negotiation when some pre-set conditions have been met. Smart contracts are largely executed by virtue of chains of cryptographic hashes. A chain of successive blocks is used to validate whether the set guidelines have been met, if yes the contract algorithm publishes the result indicating whether the conditions were met or not. An instance of a smart contract in clinical trial would be for setting criteria for eligibility to study. If a patient has a certain condition that makes them eligible to participate in a trial, they are algorithmically added to the study. Each of the steps in the trial is documented and chained to consolidate a credible and transparent study. Almost 10% of all studies monitored by the US Food and Drug Administration record an instance of consent violation. These violations range from blatant disregard to obtain consent, invalid documentation, unapproved forms or failure to revise consent. Blockchain, however, offers a simple and efficient way to ensure that consents are collected in the right order, form, and structure. Blockchain provides with a unique master document that is used to hold all the consent data in a single structure called the Chainscript. Every piece of data in the Chainscript is bound to a revised protocol version. The data is also cryptographically encrypted with hashes to ensure that it is not accessible to unauthorized persons. Overall, the Chainscript provides a robust, secure and provable means collecting and collating patient consent in clinical research. Over and above, the application of blockchain in clinical trials will aid in giving patients more control over their data. Blockchain helps to place patients at the center of the clinical trial ecosystem. Blockchain also helps in accelerating recruitment of participants and collection of consent. Generally, blockchain provides immeasurable opportunities for application and development in clinical trials. Numerous studies and professional bodies have shown the potential of blockchain in streamlining the clinical supply chain, patient incentivization, longitudinal patient approach and health information exchanges. Below we look at some the currently undergoing blockchain projects related with clinical trials and research. One of the most high profile projects involving blockchain and clinical trials is MIT’s Enigma. The project is aimed at implementing a distributed and secure platform for sharing data over the cloud. Enigma hopes to facilitate large-scale sharing of data on a restricted perimeter. Users are accorded the powers to share data with entities which they prefer. Clinical trial data can, therefore, be shared among researchers, physicians, publishers, and even patients. Enigma operates behind the vision of differential privacy, whereby, users are allowed the ability to choose the equilibrium dose between sharing amongst approved parties and publicly transparent data. In 2016 the government of Estonia launched a blockchain platform that would be used to protect medical records of over 1.3 million Estonians. Dubbed the Estonian E-health foundation the project is aimed at archiving all health records using activity logs. According to the foundation’s architect, Artur Novek, the platform will add an extra level of security. With one single source of truth that is immutable and provable, conducting clinical trials and research is enhanced, since there is a large pool of data with a consistent baseline and architecture. Aside from these two notable projects, there are several other developments in the pipeline pertaining to blockchain and clinical trials. Other projects like Hu-manity are focused on creating a digital marketplace for clinical data. Research is also underway on consent and clinical trial protocols, data sharing, statistical analysis as well as analytical code. Like any other emerging technology, blockchain is a largely noble idea in clinical trials, but it is also faced with significant challenges and limitations. While the operational side works seamlessly, there are numerous issues concerning processes, protocol, and policies. Questions have been asked over the ability of blockchain to conform to regulatory guidelines such as the HIPAA, FDA, and GDPR. Others have questioned over the issues of incentivizing sharing and managing consents as well as smart contracts. Additional concerns have also been raised about data ownership and validation. Overall, blockchain is a technology that offers a lot of promise and potential. While still capable of revolutionizing clinical trials and the healthcare industry as a whole, there are bottlenecks that must be overcome. With continuous innovation and advancement, it is possible to surmount the aforementioned challenges. As Pikcio, our core business is personal data, this is why we are the best actor available in the clinical trial situation. We will strive to be present on phase I (healthy volunteers), II (small group of patients), III (comparative, high number of patients) and IV (post-clinical) of the clinical trials. Our solution will provide a tailor-cut experience for companies and individuals on-going a clinical trial. Our blockchain technology empowers both entities in the management of their data and through the entire process. We have developed our own private chain allowing us to adapt exactly to the needs of stakeholders. First of all, we provide a highly secured, verifiable and transparent digital consent management. You can easily link a patient to its digital consent and as it is required by the law he can retract it whenever he wants. The consent form is signed digitally by the patient (unique private key, password, KYC,etc..) and we can ensure his identity on the blockchain. Our digital consent is encrypted but easily findable by authorized entities. No more looking everywhere for a patient consent form, no more hassle for the signing or withdrawing. Everything is shared between you and your patient in an entirely medical oriented interface targeting the different needs of the operator and the patient himself. If the consent hasn’t been retracted by the patient at the end of the clinical trial, it can still be found if necessary to provide proof of it later. Once the consent out of the way, we can focus on our main objective data management. We offer a full data management module for clinical trials where both you and the patient can easily pain point results and event of interest. The data is encrypted to our blockchain and tied to the patient digital ID, you can upload results, imagery, observations, adverse effects, treatment , biological parameters, vital parameters, etc… All the areas of the clinical trial will be covered and we are open to feedback to add any feature you might find useful. This also puts he patient at the center of your clinical trial as every update made to his case is trackable by him on his personal profile. The patient can have a better understanding of his health and results and a way better implication in the project. In fact we provide a highly customizable notification system allowing you to send critical reminders and information to your patient as well as reducing drastically the plague of clinical trials, the ‘lost to follow-up’. By reminding the patient of his appointments, treatments and feedback you avoid a lot of the lost to follow-up weak points. Blockchain offers an incredible opportunity for enhancing and streamlining clinical trial’s processes and procedures. Courtesy of its transparency, integrity, decentralization, auditability and innovative features such as smart contracts blockchain offers a myriad of innovation opportunities. Ultimately blockchain can help iron out data donation issues and pain points such as lack of trust, incentivization, poor enrolment, consent collection among many other issues. 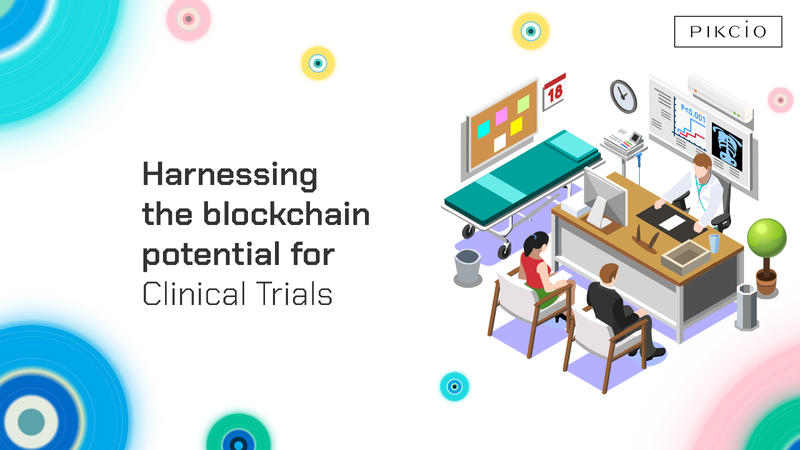 While blockchain may not be able to solve all the troubles of clinical trials and research, it will definitely improve and enhance the process and procedures. This emerging technology promises to provide an innovative and unique model for conducting clinical trials. By committing to regular and continuous encryption and protection of data research teams will yield better efficiency, collaboration, and cost reduction. Given that the technology is in its nascent stages we are bound to witness even more ground-breaking solutions going into the future.